VINCENT OFFERS TO SACRIFICE HIMSELF TO PROTECT CAT — Vincent (Jay Ryan) revives a 19-year old boy who was left for dead in a dumpster and rushes him to the E.R., where he remains in a coma. After Evan (Max Brown) declares that the boy’s x-rays reveal a history of bone fractures, Cat (Kristin Kreuk) and Tess (Nina Lisandrello) question the father, Zachary Holt (guest-star Alex Carter), who worries that his son’s ADHD and history of fighting and gambling might have gotten him mixed up with the wrong crowd. The detectives question Lois Whitworth (guest-star Madchen Amick), who owns the Westchester Polo Club where the boy worked. Lois is surprised to learn that her daughter, Clarissa (guest-star Jenn Proske), has been dating this young man. Clarissa claims that she ended the relationship because he was involved in illegal activities, but Cat and Tess suspect that there’s more to her story. Meanwhile, Silverfox (guest-star Peter Outerbridge) and his Murifield agents track down Cat, and offer to tell her the truth about her mother in exchange for turning over Vincent, who they insist is a monster. Cat tells Vincent about her Silverfox encounter, and Vincent realizes that Cat might be afraid of him. JT (Austin Basis) wants them to flee, but Vincent refuses to leave Cat, instead offering to surrender to Silverfox in exchange for Cat’s safety. Bradley Walsh directed the episode written by Roger Grant (#103). 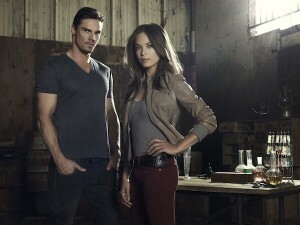 Beauty And The Beast premieres Thursday night, October 11 on The CW. Hope to see some of you chatting about it in the KSiteTV Forum!